Recently, I saw a fellow Facebook user post about Postpartum Week. She shared her experience. I was inspired by her courage. I liked her post, thanked her for sharing her story, and turned around to share mine. I received some of the same feedback—people thanking me for sharing my story. From my life experiences, I have come to believe that talking about our struggles helps us. Yet, when we share our experiences, our struggles, and how we came out on the other side…that, my friends, helps others. When we make the switch from talking to help ourselves to sharing to help others—that is what changes the world. So, when I was talking to Allison about sharing my experience on Facebook, I told her that there were some responses that I didn’t know what to do with. Comments like, “Oh, I didn’t know you went through that” or “I’m so sorry you went through that.” I just shrugged them off. In my mind I was comforted, but I felt like I was supposed to share. I thought it wasn’t a big deal. Period. End. Of. Story. My response to them was like a slap in the face—my own face. I’m sure my response didn’t help them, either. Shrugging off these responses does nothing to change how we help mamas going through postpartum struggles right now. So, what do we DO to help Postpartum Mamas? What should we say? Just listen. Odds are, Mom just wants to be heard. Listen to what she is saying, and give feedback when she’s open to hear it. When she asks you to change baby’s diaper, take out the trash, help with chores. Complaining and grumbling may make her feel bad or frustrated. She’ll try to do it all on her own, and taking on the responsibility all on her own can cause more anxiety and depression. There are many supports out in the community to help new moms. If she isn’t doing it herself, stop by her house, bring her food, hold baby while she sleeps. Moms—new moms especially—need community. Be there fore her. She’ll join the other supports when she’s ready! Gently let her know that getting help is okay and even a good thing. Honestly, if she’s not ready, she’s not ready and she won’t hear it. If she’s open, let her know that getting help or seeing a counselor is good to do. Check to see how much your insurance will cover or if your employer has an Employee Assistance Program. Let her get filled up. Ask her how much time she needs to step away and what does she want to go do. Encourage her to do it. Lovingly tell her to get out of the house and not come back for an hour. If she doesn’t know what she wants to do, she’ll figure it out in due time. Know the signs. Is she acting differently than before baby? Don’t wait until she’s hit rock bottom to encourage or help her. By then, it will be a lot harder and a lot more work for her to get back to her healthy self. This isn’t an end-all and be-all. Take from it what you will. If one thing works, great! You know the “new mom” in your life best. Use your gut instinct on the things you think she needs, and just show her love. 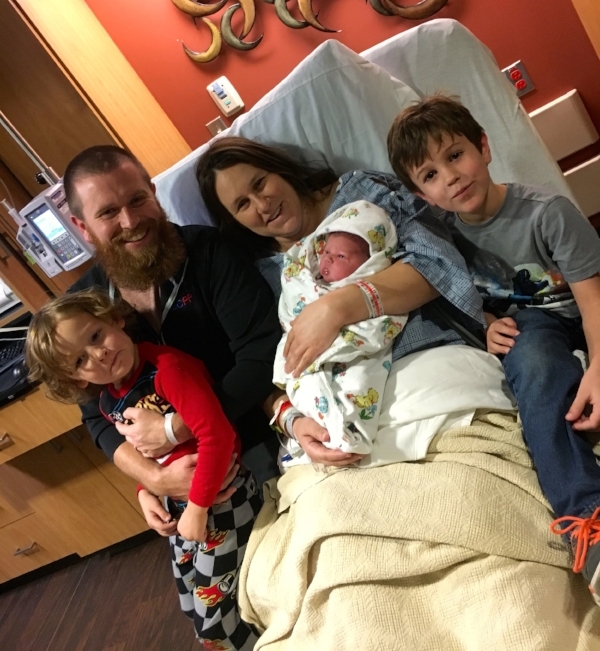 The Arrington family welcoming their newest addition! Big thanks to Jessica for writing this guest post! Her openness about experiencing postpartum depression has taught me so much, equipped me to walk alongside women with postpartum depression, and inspired me to keep talking about mental health, even when it's hard.